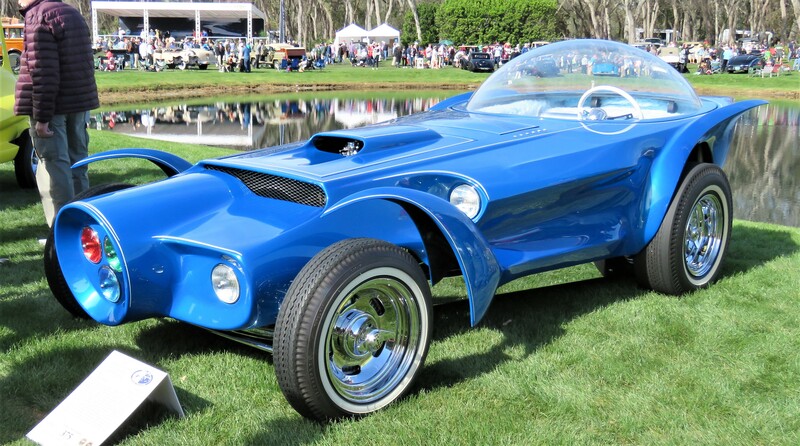 Those of us who were around at the time remember the 1961 Beatnik Bandit as the outrageous, trend-setting show car that set the course for custom car builders well into the 1960s, a bubble-topped cartoon-on-wheels hand-built by the iconic beatnik himself, Ed “Big Daddy” Roth. 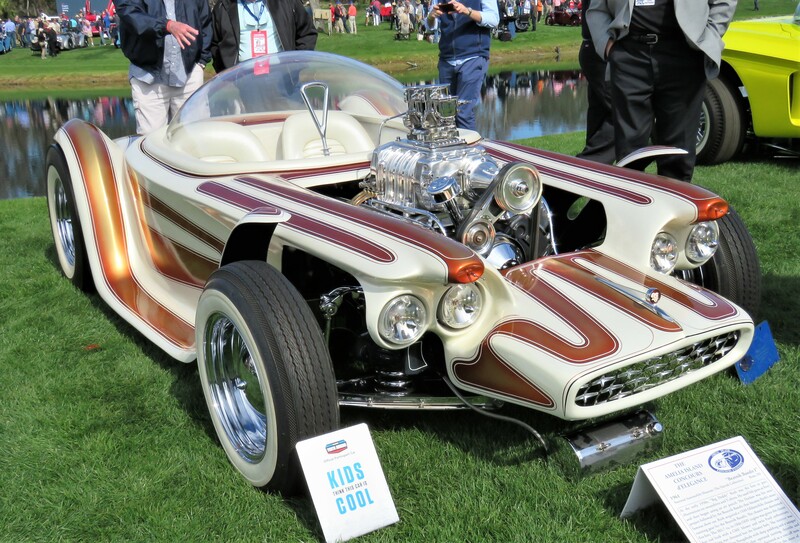 The presence of Beatnik Bandit was one of the greatest treats of the recently held Amelia Island Concours d’Elegance, where it took its place among a bevy of Roth’s other wacky creations presented in a class of their own. This car was a blast from my pre-adolescent past, and familiar to millions of young gearheads at the time because of Revell’s Beatnik Bandit plastic-model kits they glued together. I was one of them, and the Beatnik Bandit is an unforgettable image from those days. Of all the fabulous cars at Amelia, this oddity was the one I most looked forward to seeing. 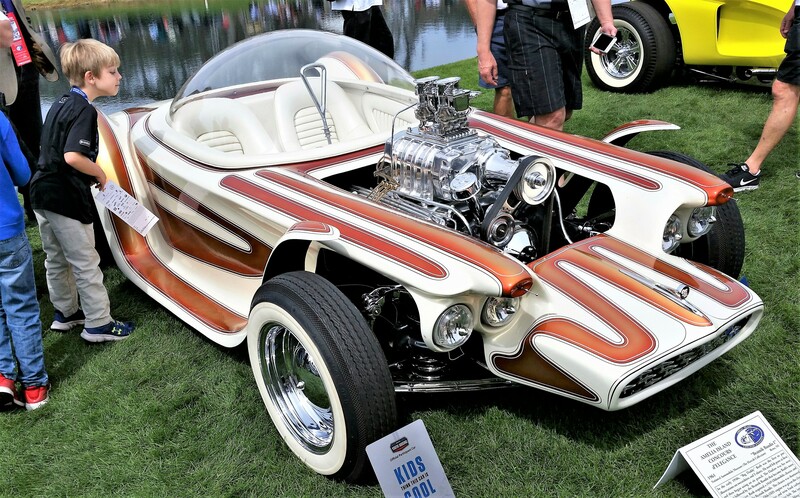 “It was part of that counter-culture movement that was blooming in the ’6os, and Ed Roth was part of the Beat Generation coming out of the ’50s and continued on from there,” said Jay Hubbard, automotive collections manager at the National Automobile Museum in Reno, Nevada, which brought Beatnik Bandit and some of the other Roth cars to the concours. The Beatnik Bandit was purchased and restored in the 1970s by Reno casino mogul and epic car collector William Harrah; a portion of his vast accumulation of vehicles became the National Automobile Museum after his death. When I came upon the Bandit at Amelia, it was surrounded by a group of Hagerty Youth Judges, kids in blue shirts and red hats who were eying this object from outer space with bemused amazement. This was one of the concours cars to get special attention from the young judges for a possible award in a program sponsored by Hagerty collector car insurance. The kids were questioning Hubbard about the car as part of the judging process. 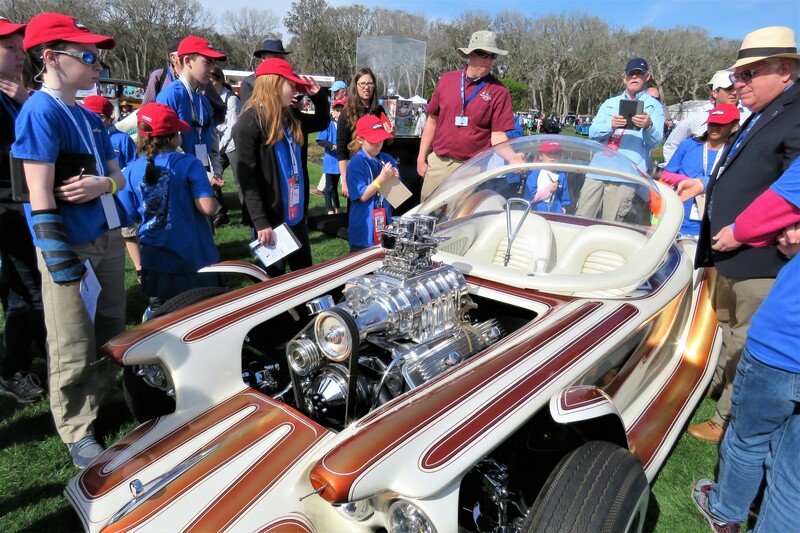 “How fast will it go?” one young judge asked as he eyed the gigantic, chrome-plated, supercharged V8 engine sprouting from the front of the car. Hubbard explained that the Bandit, like Roth’s other custom rods, was not really made to be driven, just shown and admired. And turned into scale-model kits. After the Hagerty kids had moved on, Hubbard told me that Roth built the cars not as actual automobiles but as artistic expressions and as pieces of pop culture touchstones. 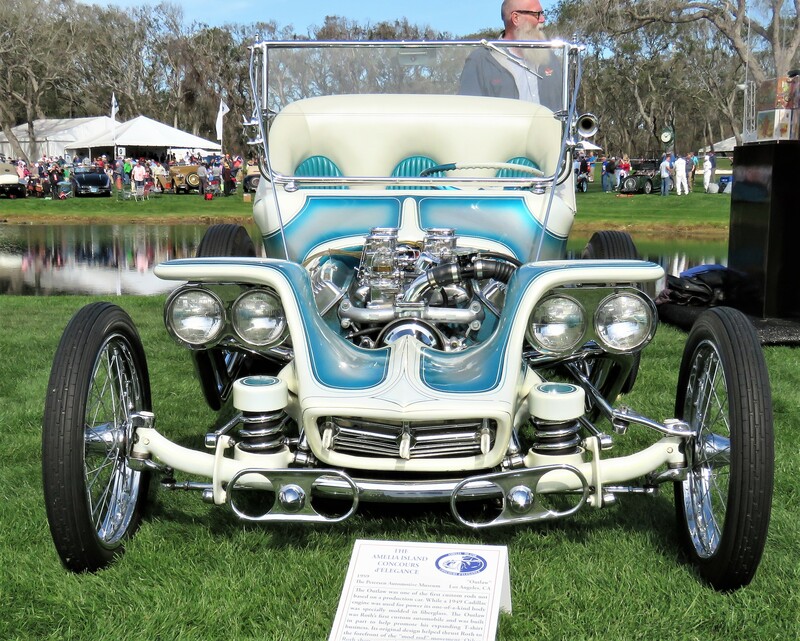 “It’s a hot rod and it’s a custom, but it’s a show rod because it’s not really drivable. It’s not functional. The Beatnik and a lot of his creations after that were not so much function as they were form. As an automobile, they were a lot more art. The art of the automobile is highly underrated in many circles. 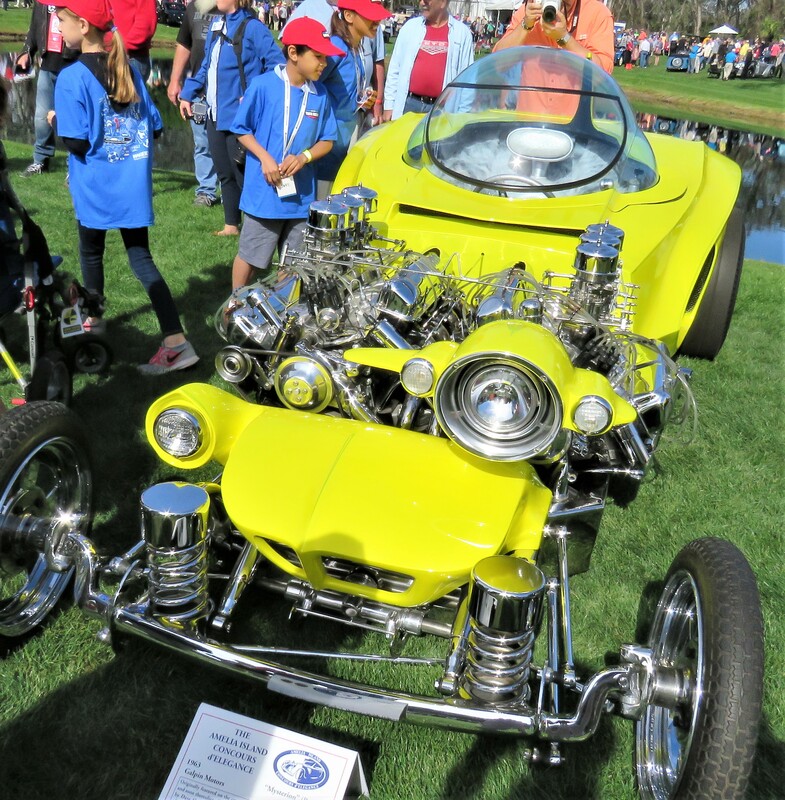 Hubbard told me that the Beatnik Bandit and Roth’s other crazy customs at the concours were getting an enthusiastic response from young spectators, who seemed entranced by such madness from so long ago. Of course, Roth was also famous for the bizarre cartoon image of Rat Fink that was displayed on millions of T-shirts, another oddball marketing success that lives on, especially among young hipsters. Hubbard pointed out that Roth’s cars were hand-sculpted using wire mesh and plaster of Paris that was transformed into fiberglass molds to make the bodies. Beatnik Bandit’s massive bubble top was an innovative feature, he explained, specially made by placing a flat sheet of clear acrylic into a gigantic oven and heating it until it softened, then introducing compressed air to bulge the plastic. After Harrah acquired the Beatnik Bandit and brought it back to Reno, he and his crew made a concerted effort to return the car to its original form, to the extent of having Roth actually join in the restoration. “The beauty of this particular restoration is that Mr. Harrah bought this car from the Movieland Museum collection back in the ’70s, brought it back to Reno, stripped it all down; it was two tones of metallic avocado green, really interesting, but they wanted to bring it back to the 1961 look, the original Beatnik look,” Hubbard said. “So they got the gold colors and everything, and Ed was very cooperative, told them all the paint formulas and such. Roth still stands alone on the firmament of custom car builders, in Hubbard’s view.